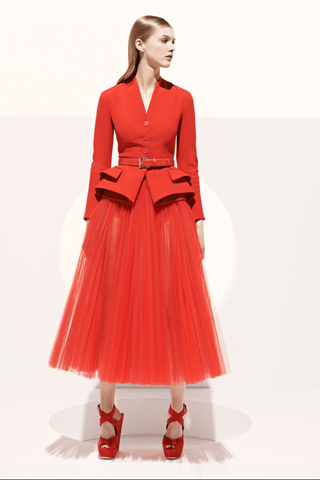 The current Resort collection will be Bill Gaytten's last at Dior before Raf Simons takes over. I can only assume he suffered from some kind of brain explosion - that Miu Miu dress was by no means obscure, having appeared on several magazine covers and red carpets. One can't help but feel for Gaytten. I don't think I've read a single article on him that hasn't contained the phrase 'big shoes to fill'. No doubt it will look beautiful on Marion Cotillard. Is this look a hint of what might have been had Gaytten had more time and less pressure? I don't think so. In fact during his tenure as head designer at Dior, Gaytten created a number of ravishing New Look-waisted ensembles, often incorporating some impressively un-frivolous tulle skirts (like the red one, above). He drew from the Dior archives and displayed the same spooky ability as his predecessors to make sensible women want to cinch their waists and pad their busts. For this alone, he deserves to be more than a footnote in the fashion house's history.